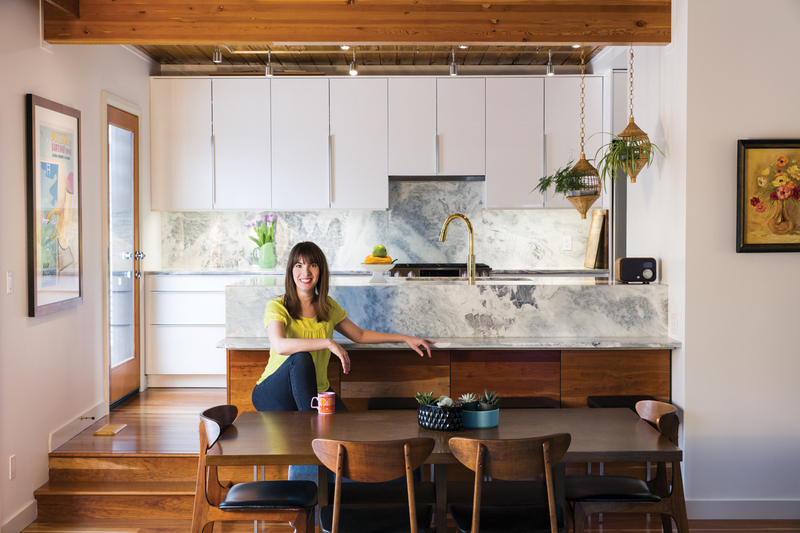 Jennifer Grimm and Michael Strong updated their mid-century modern space while keeping the spirit of the home intact. 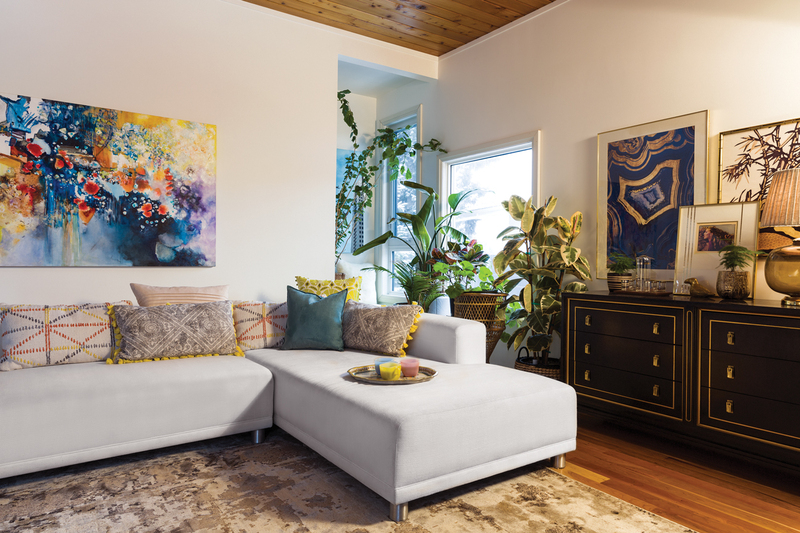 When Top 40 alumna and owner of Lux Beauty Boutique, Jennifer Grimm, abandoned condo life in the core, she was determined to shape the new space into her family’s dream mid-century modern home. She and her husband, Michael Strong, an urban planner for the city, purchased their 1,350 square-foot Forest Heights home six years ago and, upon walking through the flamingo-pink front door, it isn’t hard to see that they are well on their way to their goals. “Doing all this work always makes me think about celebrities who are on the best-dressed list. If we all had world-famous designers making our clothes and curating our outfits, what’s the big deal? But to really pull together from all different sources yourself, it’s a whole other story. It’s way more work, but also way more personal, way more fun,” says Grimm. Though Grimm and Strong had no qualms with condo living, they knew if they found the perfect house they would want to make the change. So, the two constantly kept up-to-date on the real-estate scene in Edmonton. It was important to them to find a mature neighbourhood near the river valley and a mid-century modern build. So, when this home went up for sale, it was love at first drive-by. Once the couple learned about its history, they became even more attached. The original owners, Josef and Grete Illmayer, are well-known in Edmonton for being a part of many hospital builds and public works. They kept the home in pristine condition and all the unique features remained intact, like the brick fireplace and cherry-wood ceilings. Grimm and Strong wanted to ensure the spirit of the 1962 design would shine through the style in their home. “Over the years, even though we obviously never met the original owners of the home, we’ve created this entire imaginative profile of who they were. Because you can tell a lot about a person from their design choices. And we want to cherish and highlight those choices,” says Grimm. Her father, a contractor by trade, was instrumental in the process. They began renovations in the bathrooms and bedrooms and then moved into the kitchen, dining room and living space. They also had to re-insulate the entire home and replace the roof. Grimm, the self-proclaimed plant-adopter, acted as the in-house design visionary, while her husband executed the plans. “It took some living in to really understand what was most important for us to change right away and how to use the space in terms of where we spent most of our time,” says Strong. That’s why the bathrooms were the first to get an update. The new and improved main bath is fully tiled from floor to ceiling, keeping with the style of the ’60s. A custom vanity sits beneath reclaimed light fixtures, and the cupboard was a spur-of-the-moment invention by the couple. They needed more storage, so they built the shelving right into the studs for extra storage without sacrificing extra space. Downstairs, the bathroom still has its original mint green tile and round chrome air-vent. In their home office, a couch with strong bohemian vibes sits surrounded by huge plants. One of Grimm’s favourite pieces sits against the wall. 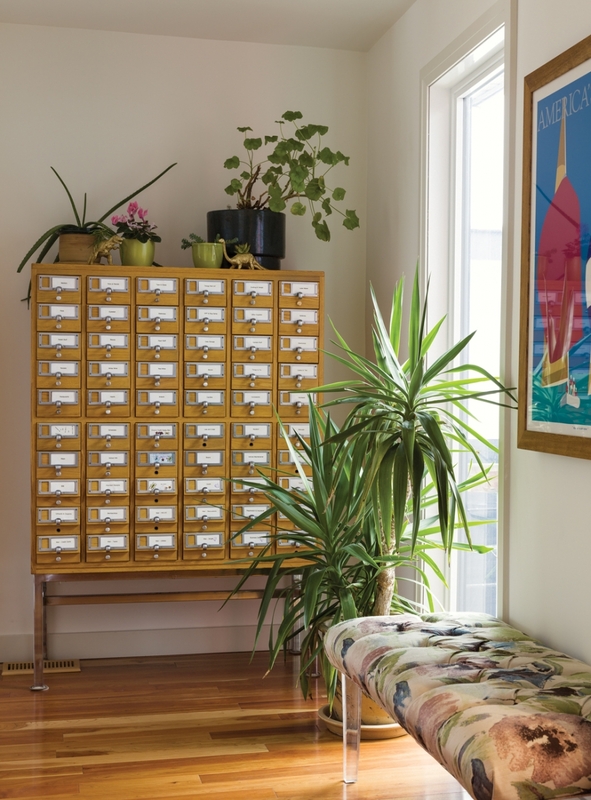 The chest of drawers happens to be an American of Martinsville – a very prestigious brand that dates back to 1906 – and the people who sold it online had no idea of its value. The set is valued between $2,000 and $3,000; Grimm paid $200. The matching dresser is in the living room. “Everything in our house comes from three types of places,” says Grimm. 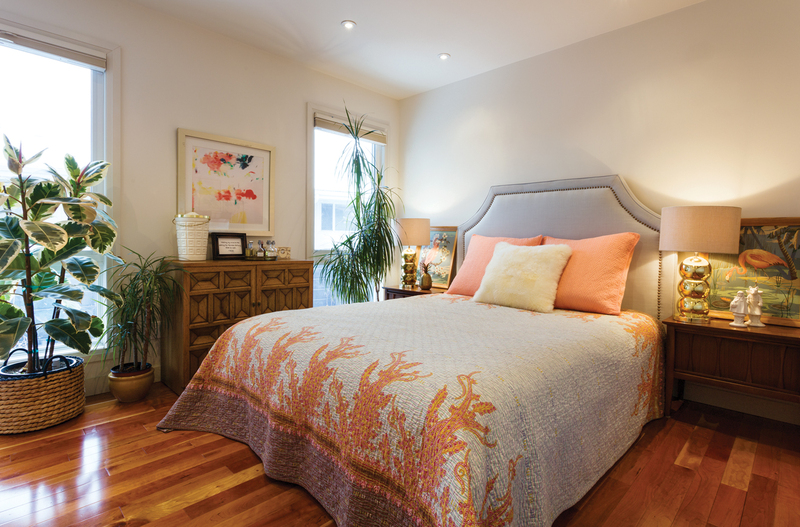 “Super high-end and niche-inspired home interior boutiques, second hand vendors like Value Village and Kijiji, or HomeSense. It’s one of those or nothing.” With Grimm’s eye for salvaging old pieces and her desire to let things “live out their destinies,” each item in the house has an experience and a story attached to it. The couple also love art, and all kinds of it. Cartoon-ish and colourful pieces in some areas of house are contrasted with abstract or Mexican-inspired art in others. In the living room, a large-scale piece by Chrissy Chung is their favourite. Near the basement stairs, a frame is filled with cartoon watermelons. In the front entryway, they decided to make their own art. Since they were unable to find a large-scale piece of good quality art that would fill the huge entry wall at the time, the couple looked to Pinterest for ideas. “We actually grabbed one of our daughter’s books. She has a lot of second-hand and vintage children’s stories.” They discovered Margaret Mahy’s A Lion in the Meadow. The story tells of a boy who discovers a lion near his home and is given a box of matches to scare it away. “It was published in the ’60s and we found a really great illustration and pulled out the three colours from there.” The result is a daring and unconventional paint job, with three pastel colours across uneven portions of the wall. Around the corner sits a gem of a cabinet – a 300-pound catalogue from the University of Alberta’s surplus warehouse that Grimm brought home on one of its open-to-the-public days. Atop the library-style cabinet sit metallic gold dinosaurs with greenery growing from their backs. “People typically have junk drawers that they have to search through to find things,” says Strong. “This is ours, but it’s huge and it’s organized and everyone can find their stuff.” And, in true Monica Geller fashion right out of Friends, a drawer near the top right of the cabinet has been labeled “label maker” by Strong. The kitchen and dining room have seen the most change since the renovations began, and also took the most patience. The white cabinets allow for a beautiful python quartzite stone to become the focal piece in the space. The countertops wrap up to become the backsplash and down to become a breakfast bar. The material took nearly two years to source. 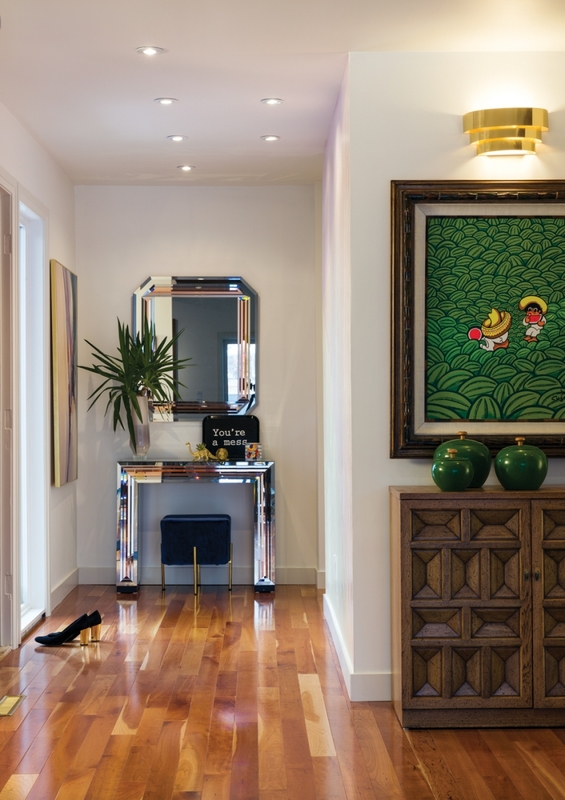 A gold tap set completes the modern and minimalistic space. Functionality in this space is important to the couple, and they added it wherever they could hide it. Beneath the breakfast bar, what looks like solid wood paneling pops open to store china and other less-used kitchen items. 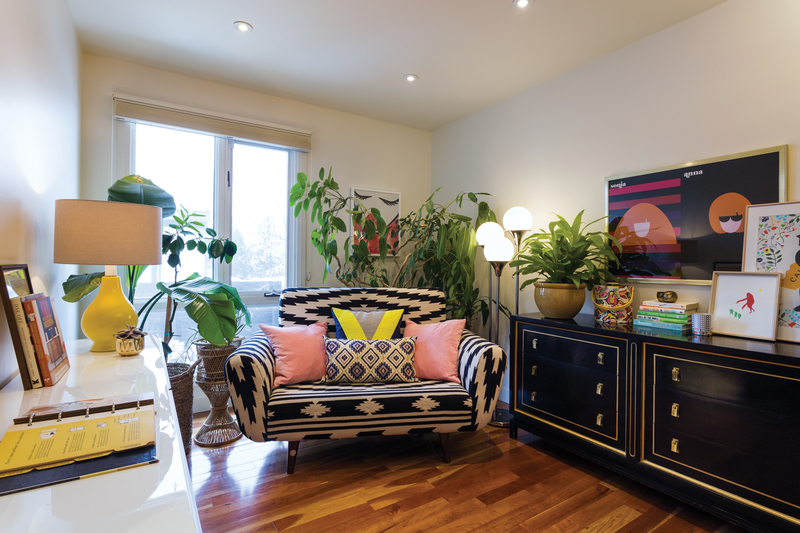 Into the living room and throughout the rest of the house, functionality and fashion intersect. The mid-century modern decor includes statement pieces like a large wicker chair, a low, flat couch, and a white-washed brick fireplace. Unique knick- knacks sit on surfaces around the house, like a brass duck and a cross-stitched Kanye West quote. A mix of fresh greenery and antique pieces create an atmosphere that always offers something interesting to examine. Throughout the home, cherry wood floors honour the era of the original design.